Load the Data and Estimate a Model. Estimate the Probability of a Future Event. Plot the Distribution of Passengers at a Future Time. This example shows how to simulate sample paths from a multiplicative seasonal ARIMA model using simulate. The time series is monthly international airline passenger numbers from 1949 to 1960. Load the data set Data_Airline. 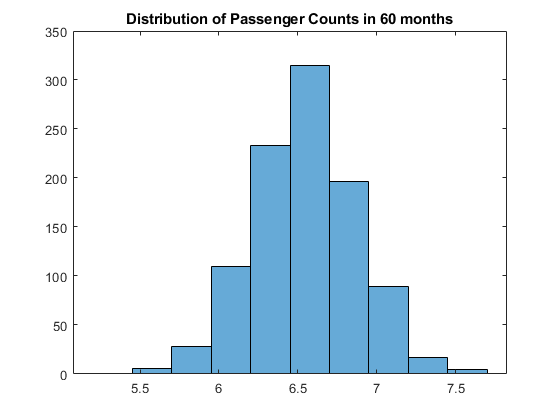 Use the fitted model to simulate 25 realizations of airline passenger counts over a 60-month (5-year) horizon. Use the observed series and inferred residuals as presample data. 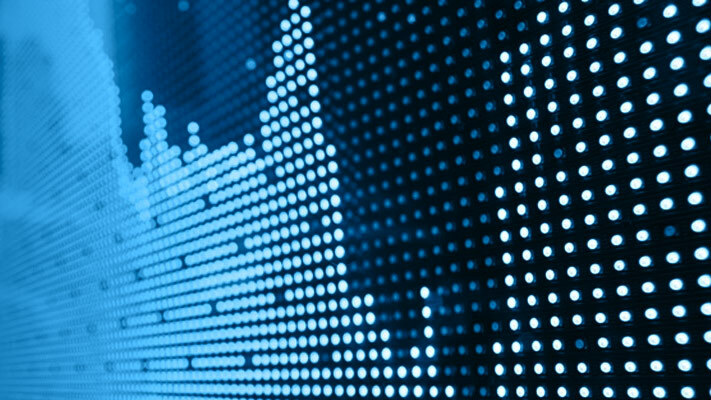 The simulated forecasts show growth and seasonal periodicity similar to the observed series. Use simulations to estimate the probability that log airline passenger counts will meet or exceed the value 7 sometime during the next 5 years. Calculate the Monte Carlo error associated with the estimated probability. There is approximately a 39% chance that the (log) number of airline passengers will meet or exceed 7 in the next 5 years. The Monte Carlo standard error of the estimate is about 0.02. 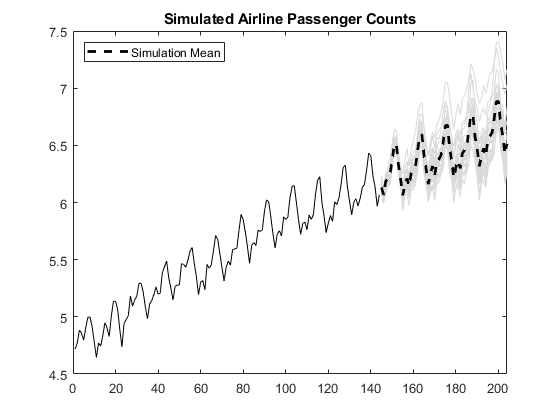 Use the simulations to plot the distribution of (log) airline passenger counts 60 months into the future.